A Healthy Mum Is A Happy Mum! As a new mum you quickly exchange your handbag for a larger, more practical nappy changing bag, and the inventory of essentials, once a lippy and mascara, turn into nappies, wetwipes, tissues, muslins, bottom cream, blanket, toys, spare clothes, hat, snacks, bottles….etc etc. You carry this slung over one shoulder, and your precious bundle of joy tucked under the other. You then attempt to get both into the car, often contorting your body into ridiculous positions to avoid waking the little one. Finally you heave your buggy into the boot, trying your best not to upset your husband by scratching the car paintwork, and set off on your journey, completely exhausted having had precious little sleep the night before. It’s not surprising that most mums feel they have absolutely no time or energy for exercise. You also can’t just pop out for a quick run or sweat off a few calories in the gym whenever you feel like it. You have to consider childcare, sleep routines, nappy changes and feed times, not to mention trying to fit in a spot of manic housework before the day ends. However this is an essential time in a mother’s life to start caring for her body. Although losing the pregnancy weight is important, training to avoid injury is also essential. You need to develop strong shoulders and arms to not only lift, but also contain your growing and increasingly mobile offspring. You need to strengthen your back, core and pelvic floor to not only return it to its pre-pregnancy state, but also enable your body to cope with the contortionistic and weight-lifting challenges of motherhood. Exercise is also an immense energy booster and a great way to fight the baby blues, especially if you can do it outside in the fresh air and with friends. Although not always easy, it's really important to prioritise some time each week when you can focus on yourself and looking after your body. It doesn't matter whether your aim is to comfortably fit into your pre-pregnancy jeans again, get your body ready for your next pregnancy, avoid injury or to get that exercise feel-good factor. Enlist the support of your partner, friends and family, and make time for at least 2 to 3 workouts a week. By taking a little time out to do something for yourself, everyone around you, including your baby, will benefit from you being happier and healthier! Hands up who has looked out of the window recently and been turned cold by the thought of exercise? You could be forgiven, but think again because maintaining or even starting a new fitness regime in the winter is actually proven to boost your immune system, stave off winter blues and set you up perfectly for wearing those skimpy summer clothes. There are in fact loads of reasons why it’s worth getting kitted-up and braving the chilly conditions for a workout. So, from what to wear to how to tell if you’re well enough to do exercise, here are just a few tips from Kate Dorward, HA Fitness Personal Trainer, to help motivate you into action. The average person puts on 7 to 12 lbs (approx 3 to 5 kg) each winter, mainly thanks to Christmas excesses and because during the short, cold and miserable winter days, we crave comfort foods to lift our spirits. Added to that, exercise often takes a back seat in extreme weather conditions. But just because it’s winter doesn’t mean going into exercise hibernation. Winter does boast cool, crisp, bright days where a layer of shimmering frost has never made your local park look more magical, but even when it’s not like that and it seems like it’s been raining non-stop for as long as you can remember, there is reward for braving the elements. Those who make the effort to get out for a walk or a run on these days will testify that they often get the most satisfaction from their achievement. Not only does getting out of the house to do some exercise get you safely out of reach from the biscuit barrel, it will help you boost your energy, blitz body fat and beat cravings. The key to ‘enjoying’ exercise in inclement weather is wearing the right kit. Wear several layers, including a hat and gloves, to keep you warm, especially as you warm up and cool down. During the main section of your work out you should get pretty warm, so make sure your top layers are light so they can be easily stowed or tied around your waist. If it’s raining, a cap to keep the rain off your face, and a water-proof coat are a must, as once you’re wet you will cool down very quickly. Spend longer warming up to avoid injury, and think about keeping your cool down short, perhaps completing stretches from the warmth and comfort of your home. Taking your baby out in the worst of the weather might seem odd, but fresh air is always good for little lungs and a healthy dose of oxygen does wonders for relaxing babies. 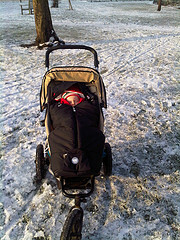 Provided your little one is layered up too and has a hat and gloves, as well as a snuggly suit and/or cosy toes to nestle into, then they should be happily cocooned in their buggy. Always have your rain cover to hand, not just to avoid getting wet but also because it will protect your baby from the chilly winter wind, which can make it feel colder than it really is. As already mentioned, exercise boosts your immune system. Regular exercisers are proven to suffer from fewer ailments and to bounce back better following illness. What if you already have a cold? Is it safe to exercise or should you cosy yourself in at home until you feel better again? Of course it’s down to you to decide, but the general rule of thumb is that provided you don’t have a temperature and your symptoms are from the neck up, then a bit of fresh air and some gentle exercise are helpful ways of helping clear a stuffy nose. If you are running a fever, or are experiencing symptoms from the neck down, then you are excused and a date with the duvet is perfectly legitimate and necessary to get you back on your feet. Mum’s have the added worry of their little ones health. If your baby has a sniffle is it wise to expose them to the icy air or will that make them worse? The same rule applies: provided your baby is not running a temperature and is only suffering a mild head cold, then getting them out of a stuffy environment and into the fresh air is generally regarded as a good idea. As mum’s ourselves, we can also vouch that a change of scenery is always helpful in calming a grisly tot feeling a little out of sorts! A final word: if you’re currently hiding under thick baggy jumpers, remember there are fewer than six weeks until spring. So if you want to be ready to shed the layers and wear your skimpier wardrobe with confidence, now is the time to start putting in the effort!